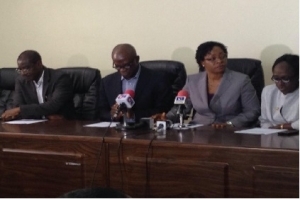 Lagos State Government officials briefing journalists on the possibility of Ebola Virus in the state. The Lagos State Government has confirmed a possible case of Ebola Virus, which is been currently investigated while treatment is on for the 40 year old Liberian, who is now a suspect, and a possible 30 others who may have had contact. The Special Adviser to the Lagos State Governor on Public Health, Dr Yewande Adeshina, in a briefing noted that the 40 year old Liberian is in a private hospital in the Obalende area of the State. Dr Adeshina also noted that the hospital housing the Liberian has been cordoned off and the victim isolated. She warned residents to “keep personal and environmental hygiene” and urged those who notice “strange feeling or symptoms similar to those of Ebola virus, which ranges from fever, headache, diarrhea, nausea, vomiting, sore throat and joint pains, which are all symptoms of other ailments, to visit competent health facilities”. In the absence of such facilities, she said residents should call the following numbers 08023169485, 08033086660, 08033065303, 08055281442, 08055329229. The State government had earlier in July laid out some precautionary measures to stop the outbreak of the disease, that has ravaged neighbouring west African countries, in the state. He listed measures that will help in stopping the outbreak to include; washing of hands often with soap and water, avoiding close contact with people who are sick and ensuring that objects used by the sick are decontaminated and properly disposed. He advised health workers to be at alert and ensure they always wear personal protective equipment as well as observe universal basic precautions when attending to suspected or confirmed cases, and report same to their Local Government Area or Ministry of Health immediately. Ebola has killed 632 people across Guinea, Liberia and Sierra Leone since an outbreak began in February.